At 57 years old, John Kerastas thought he was the poster child for fifty-year old healthiness: he competed in triathlons, rode in 100 mile biking events and ate a healthy diet chock full of organic vegetables. Then he discovered that he had a brain tumor the size of his wife's fist. 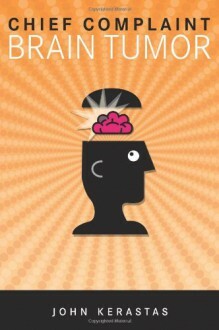 His memoir chronicles the first year he spent addressing tumor-related health issues: preparing for his first operation, discovering a dangerous skull infection, having the infected portion of his skull surgically removed, learning about his substantial vision and cognitive losses, undergoing rehab and radiation treatments, and learning to live with his ''new normal.'' According to Kerastas, the phrase ''new normal'' is the medical community's code words for ''You're alive, so quit complaining.'' As his health changed, so did his sense of humor. He writes that his humor started out superficially light-hearted prior to the first operation; transmogrified into gallows humor after several subsequent operations; and leveled out as somewhat wry-ish after radiation and rehab. This is a surprisingly upbeat and inspiring book for anybody interested in memoirs about people dealing with personal crises, for patients trudging through rehab, for caretakers helping victims of serious illnesses, or for anybody looking for an unexpected chuckle from an unlikely subject.